Yesterday we took a little road trip around the Mt. Hood Loop, from my home in Wood Village, east up I-84 to Hood River, then south on Hwy 35 towards Government Camp, and west back to the Gresham area via Hwy 26. There were a few sights I wanted to take in on the abnormally overcast day, one of them being the Hood River Lavender Farm. There you have amazing fields full of lavender, all buzzing with bees. The smell cannot be beat, and neither can the views and hospitality. We chatted with the Lavender Lady a while as my son played with Matchbox cars and blew bubbles. It was a lot of fun! I will post more from our visit later this week! Beautiful shot. I was at my hairstylist's house on Saturday, and she had a big patch of lavendar in her front yard. The bees were all over it! 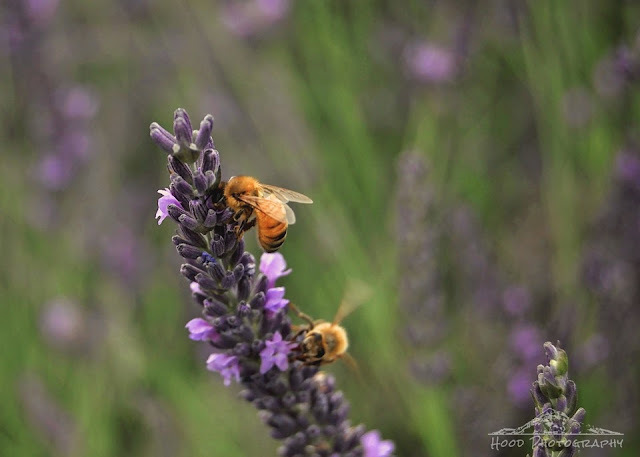 Bees do love lavender! Good shot. The emerging lavender looks so beautiful. And the bee is a bonus.